When I speak of Knowledge, I mean something intellectual, something which grasps what it perceives through the senses; something which takes a view of things; which sees more than the senses convey; which reasons upon what it sees, and while it sees; which invests it with an idea. It expresses itself, not in a mere enunciation, but by an enthymeme: it is of the nature of science from the first, and in this consists its dignity. While we can indeed identify a nineteenth-century problem of an over-reliance on memorising facts, Arnold and Newman were still quite explicit about stating that the educated needed to acquire a store of information, one considerably more demanding than that required by schools today. Have a look at how Newman would conduct an interview for university entrance if you want to see how incredibly high his standards were. Since the nineteenth century the tide has turned. I doubt there is a state school educated child in the country who could pass Newman’s university entrance exam nowadays (and I hope to look at the extent of dumbing-down in a future blog post). By their standards there would be no problem in schools today of children learning too many facts. However, even though I think over-emphasis memorisation is now a non-issue, relevant perhaps only to classes engaged in excessive preparation for exams, I mention this nineteenth century concern about memorisation because a parody of it is often the inevitable response to what I have outlined so far about the aim of education. Advocates of dumbing-down will apply the words “nineteenth century” or “Victorian” to our current education system in order to pretend we are still teaching largely by rote. Their claim often appears to be that almost any amount of knowledge, and certainly any explicit commitment to its value is a bad thing. The recall of information is to be rejected in favour of other intellectual virtues, however, unlike the Victorian critics of rote-learning, these virtues are not a complement to memorised facts, or a part of knowledge; they are to be taught instead of knowledge. They put forward aims of education that devalue all content. I have already discussed those aims that are not remotely academic. They also come up with aims that are academic, such as a) understanding b) thinking skills c) creativity d) autonomy and e) inspiration, but suggest that they can be divorced from content. We will be looking at these ideas, and their contribution to dumbing-down, in future blogposts. Hello, and welcome to The Porpoise of Education campaign. This is a holistic, interactive, empowering, unofficial successor to the Purpose of Education Campaign which aims to prepare for a forward-moving world by creating a synergy of the very confused. 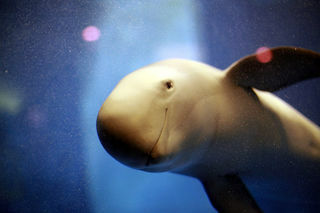 We aim to publicise the work of people who are so confused about the purpose of either education, schools or teaching, who have so completely lost sight of the fact that education has a single purpose (to make people smarter), that they could have talked about porpoises instead without anything of value being lost. 1) Confusing Aims and Virtues. We all know that it would be good if kids were happy in schools. We’d love them to be highly motivated. We like to be supportive and welcoming to those we teach. We like friendly, positive, mutually respectful relationships with our classes. We are proud of ourselves when children become interested in our subjects. We welcome it when our students want to learn about our subject in their own time, or continue studying it after they have left school. So the first classic type of confusion is to confuse any one of these factors which characterise education at its most satisfying, at its most virtuous, as the aim of education. 2) Confusing Knowledge with “Facts”. If you want to dumb down then the first place to begin is to assume that there is no “powerful knowledge”, that there is nothing worth knowing for its own sake and there is nothing that it is necessary to know in order to think effectively. There are only “facts”: dry lists to be memorised. While such lists do exist (times tables or irregular verbs spring to mind) it’s hard to believe that any secondary teachers in state schools spend more than a tiny fraction of their time teaching them (and most teachers I know use games and quizzes, or interactive teaching of one sort or another when they do so). Anyone who raises this straw man has either just been woken up from 100 years of suspended animation or is simply attacking the very concept of knowledge. 3) Confusing Accountability Measures and Purposes. This is more usually framed in order to create a straw man. The argument will be made that the purpose of education or schooling is not “to pass tests” or “get grades”. Now this is arguing against a point nobody would make. Even people who put the most insane over-emphasis on tests (if you think England’s bad for this, have a look at what’s happening in the US) don’t believe that doing well in tests is an end in itself. The purpose of a test is to measure learning (or sometimes to encourage learning) and it should go without saying that even the most fearsome advocates of tests are still concerned that learning is taking place and, if given a choice between learning and testing would choose the former. 4) Forgetting Large Chunks of History. Our education system has developed over decades. It was decided in the 1940s roughly who would be taught. It was decided in the 1960s how they would be taught. It was decided in 1988 what they would be taught. Remarkably, there is no shortage of people who seem to think our education system is Victorian or even older. Presumably this is because warmed up ideas from the early twentieth century sound more modern if we pretend the twentieth century never happened. 5) Believing there is No Continuity between Past and Future. All education must be about the future not the past. Therefore, anything said in the past about education must have been wrong and anything done in the past must be wrong. There is no discussion to be had of Newman or Arnold. The prophets of education must be contemporary figures such as Sir Ken Robinson or Sugatra Mitra. These two may both be recycling ideas from the de-schooling and free-schooling movements of the 1970s but they talk about science so they must be cutting edge, right? And we all know that new ideas are always better than old ideas because in the past people were stupid. And don’t worry, it doesn’t matter if we forget all lessons from the past, because in the future everyone will be doing jobs that don’t exist yet. 6) Confusing Institutions and Aims. The worst and most annoying way to opt out of intelligent discussion about education is to pretend that all existing institutions and their features are arbitrary, or possibly even ideologically motivated. Classrooms? Timetables? Teachers? Who needs them? They are just inventions of “the man” that are there to indoctrinate, constrain or perpetuate injustices. Children should teach themselves, preferably while sat in a field. That would work, wouldn’t it? The problem is that the usefulness of institutions can only be established when there is agreement on what they are trying to achieve. If people cannot understand what the point of education is, then they cannot analyse whether institutions are suited to that aim or not. The rest is just bluster. If you wish to contribute to the Porpoise of Education campaign then simply find an example of somebody making one of these elementary mistakes and post a link in the comments below. Let me start you off with an example of Number 4. This blogger managed to take the pseudo-history of education to a new level by trying to date our education system back to the Romans. You are currently browsing the Scenes From The Battleground blog archives for April, 2011.